the state of oregon lives in the top left hand corner of the united states, not too far from san francisco and not that far from the canadian border. portland is the largest city in the state, with a population of just over half a million. from a cyclist's point of view it's main claim to fame (well, from this side of the atlantic at least), is being the home of chris king products, but this article/interview is with one of the finest cycle craftsmen in the area, ira ryan. ira ryan builds beautiful lugged steel bicycles frames in portland, oregon, ranging from fixie track bikes, to mountain bikes, commuters, road frames, touring - well, you get the idea. definitely falling into the category of craftsman, the examples of his work that i have seen would not disgrace an art gallery. 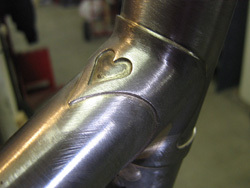 one of the specialities of his craft is a steel 'porteur' rack that fits on the front of the bike. these seem astonishingly practical and aesthetically very pleasing, and sort of makes you wonder why there are not more in daily service. if you'd like to see more examples of his work, take your browser across to iraryancycles, and while you're there, have a look at the blog of a bicycle framebuilder, part time mechanic and racer in Portland. how long have you been building bikes? "i built my first frame in january 2005 but have been a mechanic since i was 16." do you work long hours, or do you take time off to go riding and hang out? "it is a uneven balance most of the time but it all comes out in the wash. i work a lot and then i ride a lot." what's the average price for one of your frames? "average price is usually around $1300.00"
can a customer have any colour they like? "yes. i find the end aesthetic is a result of a collaboration between what the builder and the customer envision." your blog says 'framebuilder, part-time mechanic' - i would have though that a frame builder was more than a 'part-time mechanic'. "i think that working in a shop full time for years puts it in perspective. i like the dirty hands from changing tires all day, but there is something non-mechanic about standing back to see if the lug lines on a seat cluster are crisp enough, or which style chain stay slot would look best with the carved lugs. "i feel like i am crafting all day instead of punching a clock. the elements of mechanical understanding are all there everyday, but it has a deeper sense of craft for me. 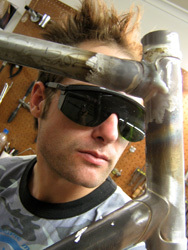 i think framebuilding allows me to be a mechanic, crafter, rider and bike nerd all at the same time." where did the bird logo come from? "ah, that's a good question to ask. i grew up on a small farm with barns and barn swallows always nested in the rafters of the old building. when i was young and starting to ride a lot i was always amazed at how these sleek little black birds could carve lines through the air. "as i got older, i saw a connection between how they flew and how it felt to ride a bike down the road with a tailwind. i think it is as close as i could every come to the feeling of flight under my own power. besides, birds and bicycles have always had a long history." there seems to be quite a cycle community in portland. is that the case? "there is a crazy cycling scene here in portland and sometimes it seems like a bit of a bubble. i tend to take it for granted sometimes, how accessible portland is by bike, until i leave and see the rest of the world. i think portland has the capability to be and continue to be a leader in bike community in the US and the world in some ways. "when i moved here i got a job as a courier and fell in love with the cycling community. there are so many cycling subcultures too - commuters, messengers, road racers, cross racers, tourists on their way across the country, zoobombers - everyone is on a bike. portland is like mecca for the bike world in the states." and are there many framebuilders? "with all the bike culture it isn't suprising that portland also has a handful of small builders too. we all seem to understand that as the whole pie gets bigger, we all benefit, so it creates a open community amongst the builders too. it comes in handy when you need a seatube or drop out in a pinch too." 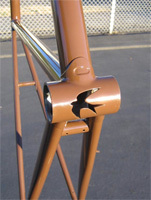 how did you learn to build bicycle frames - apprenticed or self-taught? "i apprenticed under sacha white at vanilla for a month, but i feel like my mechanic experience has proven invaluable in the understanding of construction and design, not to mention style and classic bicycle appreciation." those porteur racks seem like a really cool idea. do you get asked for them a lot? "the racks are a big part of my work. i don't own a car so i find that i ride everywhere and sometimes need to carry something larger than what will fit in a bag. 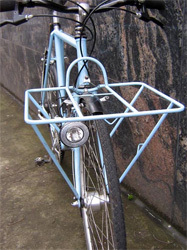 "my friend Joel Metz has been a courier for years and is into racks inspired from the Paris couriers from the 1950s. the design isn't new, but has a lot of modern relevance in a urban environment. i just built a prototype rack for kogswell to put on their 650b all round bike. i am very happy to build them and see them used everyday." what materials do you build with - is it all lugged or do you tig weld? 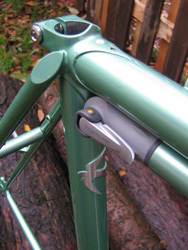 "i use all steel for frames and forks, both lugged and lugless." do you build lugged steel bicycles because of demand, or because you think bikes should be built that way? "i like the way that lugs look. 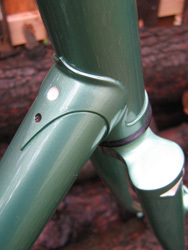 i am open to new ideas, materials and construction but i find that lugs provide the frame with all the right qualities in all the right places. modern tubesets are lighter and stiffer than those 20 years ago so they create a bicycle that lasts longer and rides better than a lot of more hyped up materials. "i am not a anti-anything else kind of person as i have raced on carbon forks and even built a fixie with carbon fiber seatstays, but i like the ride of steel in the long haul. is there much racing around portland? just cross, or do roadies and mountain bikers get a look-in? "more racing in a year than one person can do. road, mountain, cross, bmx, alleycats. when you look at the racing calendar you have to pick and choose what you want to do in a weekend. everyone is pretty welcoming too. oregon has a great grassroots racing organization that promotes racing better than the national organizations." "no. i have been too busy to train this fall for cross, but i really enjoy racing endurance events. 300 miles on gravel roads with no support kind of racing." "i have won a handful of alleycats here in portland over the last five years, and came in second (by 40 minutes) in a alleycat style race from san francisco to portland in 2003. "in 2005 i raced in the first ever trans iowa gravel race. 300 miles, self supported, all on gravel. i won, on the first frame i built, in 23 hours riding straight through. i am planning another attempt in 2007 and maybe the paris-brest-paris in september. we'll see. and finally, if you had free choice of frame (other than your own) what would it be? "that's a tough one. today it would be a moots cross bike. tomorrow...? ira ryan - a man who seems more than happy in his work, and i doubt you could ask much more than that. 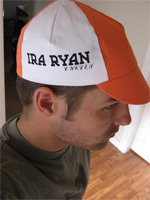 if you live in the usa or canada and fancy acquiring an ira ryan frame, you can contact him through his website. i'd like to thank ira for the interview and for supplying the photos on this page, which are used with permission.